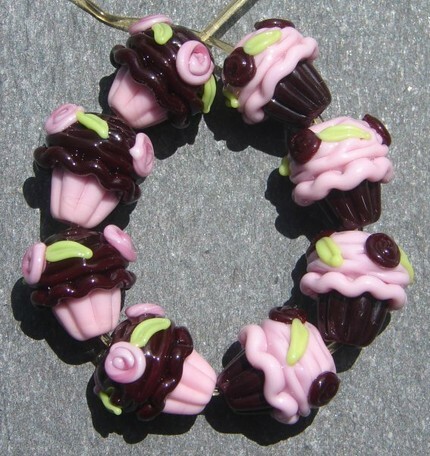 I love the soft greens and pinks in this cupcake bead by Palm Tree Queen. The size is great too so you get a nice little handful of cupcake to use on your hoodies, purses, tote bags, etc. I have 2 others, one in chocolate and one in caramel. You can see the details HERE. Other than that is hot here like anywhere else, but I keep thanking mother nature for NO big bugs and humidity that is nothing like it is in the southern states! Finally, after 4 ridiculous "March summers" as I call them, we didn't get summer heat until....gee....SUMMER! I just got some wool and am trying my hand at felting...wet & needle. I'm very excited about the wool in parisian colors of pink, black & white. My first shape test will be hearts and I'll be sure to show you my progress. I love this little guy. It's a simple charm bracelet but the chain is tiny open hearts! The handcrafted glass cupcake by Candice Mathewson is a nice weight that keeps the little silver charms on top of your wrist. You can see more details and photos HERE. I will have some tiny cupcake surprises for you next week. They are completed and I am just waiting for a client to swing by and make her selections before I know what I will have left for YOU! Cupcake zipper pulls are ready! I have this caramel one, another chocolatey one and one in pink, but my 4 1/2 year old nephew is visiting today so I only have time to post this one...you can see more pics and details HERE. I've had an Etsy shop for my paper crafts for a while now called MomsArt. Stock hasn't been moving the way I'd like. I've also had boxes of unused silver beads for even longer so I'm switching from paper crafts to selling my destash of silver. The best part is that I bought these when silver was still quite low, so every purchase is a really good deal! I hope you come visit my shop, just click HERE. You have GOT to see this insanely wonderful giveaway from Denise Yezbak Moore! She hasn't decided if one winner will get the 7 1/2 POUNDS of beads or if she will split it up between several winners. Go to her BLOG to see pictures of the beads in the individual color categories...wow! Get over there quick as the announcement is this Saturday, June 26th. Since I do not make glass beads, little glass cupcakes never fail to amaze me. 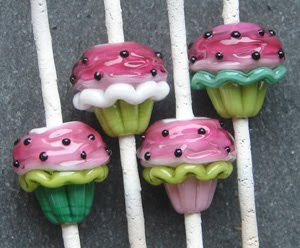 I am forever searching glass artists that impress me with a fresh new and unique cupcake "topping" so that I can provide you with one of a kind jewelry. What I am wondering today is how many of you know what goes into making one of these beads? I still have never seen a bead made live & in person but have watched videos of it. A metal rod that ends up making the hole in the finished product is coated with "release" making the bead easily removable at the end of the baking process. Then in front of a small but extremely hot table top torch, the artist begins to heat glass and wind it around the rod. Now, these artists have to think in reverse because they have to begin with the base or "innards" and work outward to the final design. That alone makes my head hurt. They also have to think chemically in order to know when the flame is ready to accept another color of glass, how long to hold the glass in the flame, when to add "sprinkles", etc. Once the bead is "done" the colors can look completely different when hot than when they are cool. This cooling process is called "annealing". The kiln (oven) is over 900 degrees fahrenheit...(I think the torches are something like 1200 degrees but I'm not sure) when the bead is placed there and in order to strengthen the hunk of glass AND prevent fractures, the kiln must cool down ever so slowly over the course of many hours. This is why artists often work at night: one, because of the heat of the torch building up in the room it can be work that is too hot in the daytime hours and two, the kiln is ready to open when they wake up the next day. So just imagine how excited they must be when they open the kiln and see unexpected colors OR see exactly what they hoped they had made! It can be a bit of a crap shoot sometimes. Now, the beads at this point still have to have their kind of chalky looking coating cleaned off and checked for imperfections making the experience even more exciting to see the bead kind of come alive before the artist's eyes. 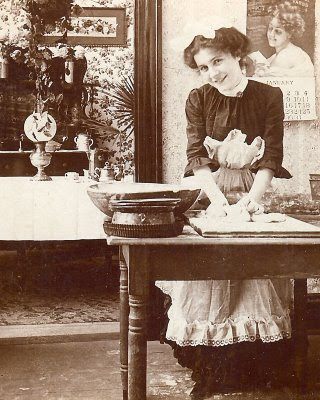 Oh to be rewarded with such amazing cupcakes! Now do you see why I am endlessly fascinated by these little works of art? Sheesh! Zipper pulls are your next surprise! 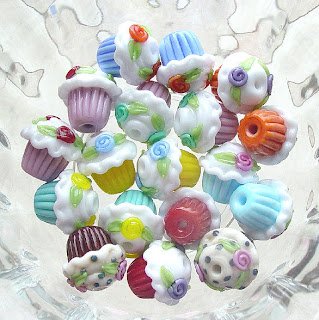 These are nice big cupcakes about 18mm high and much fuller in the cake portion than other cupcake beads in my studio. I just love this size because it gives you a nice hunk of gorgeous glass to hold on to when zipping your hoodie, purse and tote bags. I have a whole bunch of these beautiful beads, so if you need a particular color scheme, EMAIL me and I'll see what I've got in that color range and send you photos. I haven't listed these in my shop yet. These 2 will go into the display case of a cupcake shop. I'll let you know when I've got some in my own online SHOP. Still getting used to the new blogger features..ugh...but here I am so it's not so bad. It is incredibly hot here in the east bay of San Francisco today. The very rare Santa Ana winds are blowing hard. This is air that blows hot from east to west whereas most winds blow in from the ocean...west to east. The Santa Ana canyon is in the desert wayyyy south of me down in the lower third of California, but we still call these winds Santa Ana's. Here is my cool tip for this hot day that I got from some magazine. After trying several methods to keep fresh basil...well...fresh, I finally found the right one. Wrapping in paper towel and then into the grocery store plastic bag didn't work....standing the clipped ends in water in the fridge didn't work. But this totally works! Just keep the basil in the bag from the store but trap air inside before you tie it off. That's IT! And it works so well that the photos I'm showing you is basil that is over a week old...usually by this time there is some blackening but look how FRESH that is! Amazing and so easy AND it worked on my parsley and cilantro as well. 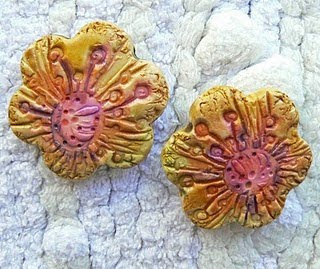 Okay, gang, here is the first cupcake surprise...sweet little post style earrings in polymer clay. How sweet are they? See more details HERE. I am in awe of the artist because this work is done in a cane style. Although it looks hand painted, each amazing detail is one more layer of clay wrapped by another layer of clay...and another...and another until the final result is achieved. It's like wearing a little work of art! I can't imagine having the patience it must require. These are especially nice because they are light as air and just perfect for women AND girls. I'm providing the standard sterling silver back as well as a soft rubber disc back for extra added comfort. I hope these were worth the wait...and there are more styles coming so stay tuned. I just lowered my shipping prices. You'll no longer see the insurance included in my shipping, but orders to U.S. addresses will still include delivery confirmation. This takes the price down to $2.00...SOooo much better than before. I just listed this Cherry on Top Cupcake necklace is my SHOP so you now have a choice of this more traditional mauve tone of cake or the light pink color. I will see you in just a day or two with the little cupcake surprises I've been talking about! I know I promised clay roses last week but my whole schedule got pushed back, so I'm working away, just not as quickly as I'd hoped! I also have to visit my cupcake jewelry display in a cupcake shop in San Jose, so that's a whole morning gone right there since it's a good 40 mile round trip. So stick with me and I promise pretty goods by next week at the latest....grrrrrrr. I just found out I won these polymer clay beads crafted by the hands of Heather Pyle. I found the contest one day when I was visiting my usual suspects for fresh blogs and this was one of the new ones to which I was led. I like that the colors are a mix of sunrise AND sunset, all in one bead. I'm excited to get them! Scrump-diliumptious Cherry on Tops are back in the SHOP. You can get matching necklace and earrings and I will make a bracelet on request. I was challenged with a custom request to make smaller clay roses than I did on my first try in February (with that blue rose above which is about 18mm). The new ones are 11mm in my custom mix of yellow and white to produce this cream color...gosh, it was so much fun! I figured out more of an assembly line method for preparing the "petal" layers so that wrapping them around each other was much faster. I also used a headpin instead of my ice pick that was perfect for the large flower but NOT these itty bitty guys! So, you'll be seeing more roses in my clay shop as this week my goal is to put at least 3 more colors THERE. I'm still working on my 2 cupcake surprise items that will be a new line for RockerJewlz, so I'll show those to you in a week or so. One is in clay and the other is in a new style of lampwork cupcake tops. This is a good week to be creating from home since more rain is on its way. I had a great 4 day holiday and hope you did too.